Milford Center, OH — Sept 2018 — With 9 acres of corn planted and their new mind-boggling design now created, the Rausch family is bringing the “MAiZE craze” back to Ohio. The popular Milford Center labyrinth, that drew thousands of visitors last fall, will once again get curious maze-goers lost when it opens to the public on Sept 15. Part of an increasingly popular “agritainment” trend, it will be joined this year by nearly 220 affiliated MAiZE sites across the United States, Canada and Europe. The Rausch family, in partnership with maze designer Brett Herbst – the world’s leading designer of 1500+ corn mazes — hopes to give even more people a chance to experience the unique source of good farmin’ fun in their newly-designed labyrinth. 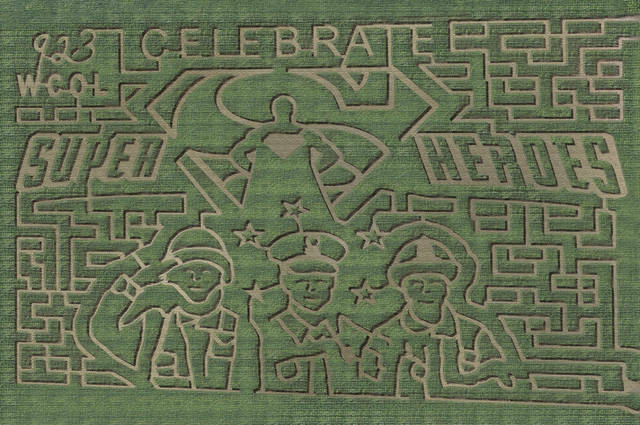 This year’s corn maze is Celebrating Superheroes. Though the correct pathways can be walked in under 30 minutes, most directionally-challenged visitors – adults and children alike — will require about one hour to travel through more than two miles of twists and turns and 85 decision points. The MAiZE will give visitors the chance to “get lost” Sept. 15 through Oct. 28. In hours are Fridays 5PM – 10PM, Saturdays Noon – 10PM, and Sundays Noon – 6PM. Field trip hours, during weekdays, are available by reservation. The MAiZE is located off SR 161, about 10 miles south of Marysville and 8 miles west of Plain City. The admission price is $9.00. Discounts are offered for families, groups and field trips. 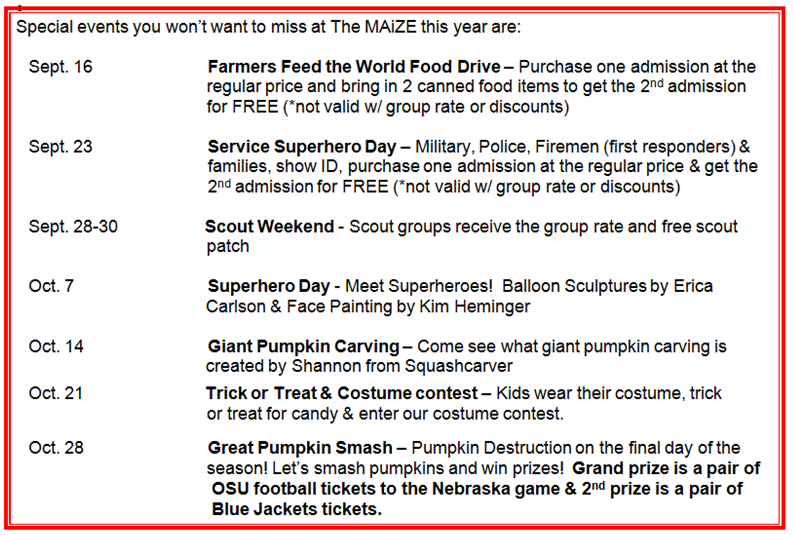 For more information or to make reservations, call 937-349-4781 or visit www.themaize.com or www.mazeandberries.com. • Open both day and night, The MAiZE caters to school field trips during the day and has created an elementary education campaign that includes: customized ag-in-the-classroom lesson plans and activity sheets for teachers, discounted field trip opportunities, on-site educational displays, and an agricultural “passport” that integrates education into the maze experience and helps guide students along the correct pathway. Teachers can access curriculum materials and field trip information online at www.themaize.com. Field trips can also be scheduled by reservation. • Interactive “passports” are available for groups and the general public. Each contains ten questions that quiz the user on a chosen subject, and those who answer the questions correctly will receive clues that guide them along the correct path to the exit. Subjects include: sports, boy scouting, girl scouting, scriptural, American history, interactive, teambuilding, 4-H, Halloween and agriculture. • In an effort to make the experience as easy or as hard as visitors want it to be, the maze has been divided into two phases. Participants will have the option to continue on to the next phase or exit the maze at the entrance to the second level. • Customized activities have been added for birthday parties, corporate outings and group rivalries/races. • In October, the haunted Field of Fright will take on a Halloween twist. Spooks will be lurking in the corn at night. • The MAiZE will also have additional activities including a pumpkin patch, hayrides, Barnyard Bouncer, corn cannons, cow barrel train, Ball Zone, Laser Tag, Dodgeball, farm animals, pedal carts, tube slide, PVC roller slide, rubber duck races, Spiderweb, Kiddie Maze, Pumpkin Blaster, Paintball Pandemonium and campfires. Oct. 21 Trick or Treat & Costume contest – Kids wear their costume, trick or treat for candy & enter our costume contest. Oct. 28 Great Pumpkin Smash – Pumpkin Destruction on the final day of the season! Let’s smash pumpkins and win prizes! Grand prize is a pair of OSU football tickets to the Nebraska game & 2nd prize is a pair of Blue Jackets tickets. The Field of Fright haunted attraction is open Fridays & Saturdays at dark, Oct. 5 – 27. Refer to www.mazeandberries.com for more information on our Special Events. The MAiZELLC represents the newest trend in outdoor entertainment for adults and children around the world, and has attracted more than four million visitors to date. Herbst, the company’s founder, has become one of the world’s leading maze designers and has completed 1500+ mazes since 1996. The MAiZE is now the world’s largest corn maze design/consulting company, with nearly 220 locations spread throughout the United States, Canada, Mexico and Europe this season. For more information about these mazes, visit www.themaize.com. WHAT The MAiZE in Milford Center, OH is a human labyrinth carved into a 9-acre cornfield. Owned by residents Randy & Jayne Rausch & family, it was designed by Brett Herbst – now the world’s leading designer of 1500+ corn mazes. Designed to challenge the wits of those attempting to find the one exit from more than two miles of twists, turns and dead ends, the puzzle provides a unique source of good farmin’ fun for adults and children alike. The first of the increasingly-popular “MAiZE craze” to reach the Rausch’s home town of Milford Center, the 10-foot-high labyrinth is the “Celebrate Superheroes” corn maze. On average, maze-goers will wander for more than an hour seeking the labyrinth’s one and only exit. The MAiZE will also have additional activities including a pumpkin patch, hayrides, Barnyard Bouncer, Corn Cannons, Pumpkin Blaster, Paintball Pandemonium, cow barrel train, Ball Zone, Laser Tag, Dodgeball, farm animals, pedal carts, tube slide, PVC roller slide and rubber duck races, Spiderweb, Kiddie Maze, Tetherball, Tug-O-War and campfires. The haunted Field of Fright will be opened at dark on the weekends before Halloween. THE MAiZE is located at 8657 Axe Handle Rd, Milford Center. It is 10 miles south of Marysville and 8 miles west of Plain City just off SR 161. Discounts are available for groups of 15 or more. WHERE ARE OUR ROOTS? The MAiZE, Inc. annually creates mazes for 280+ farms worldwide and represents an increasingly popular trend in outdoor fall entertainment for children and adults alike. Brett Herbst, found of the MAiZE company, has worked with his team to design more than 3,000 corn mazes since first introducing the concept to Utah in 1996. Providing design and consulting services to those interested in creating their own labyrinths, The MAiZE has become the world’s largest cornfield maze company. For additional information, visit www.themaize.com. PLANTING SEEDS OF KNOWLEDGE In support of agricultural education, The MAiZE has created an elementary education campaign that includes: customized ag-in-the-classroom lesson plans and activity sheets for teachers, on-site displays and tours in some locations, discounted field trip opportunities, and a “passport” that integrates education into the maze experience and helps guide children and families along the correct pathway. Also available to the public are passport subjects, including: agriculture, scouting, interactive, 4-H, American history, Halloween, teambuilding, sports, tiny tots, movies/music and scriptural. • It takes the average visitor more than one hour to discover the puzzle’s exit, while those who make all the correct decisions can complete the task in 15-30 minutes. • The origin of the maze is lost in prehistory – some five millenia ago. The first cornfield maze, however, was created in Pennsylvania in 1993. Sparking a new “agritainment” industry, there are now hundreds worldwide. • While a human maze is a pretty unique use of corn – it is only one of many. Corn, more than 8,000 years old, now has more than 3,500 uses. Traffic Advisory for the next two months. SR 95 repair work will resume 9/10/18. Curb, sidewalk, and drainage work will be completed before resurfacing begins. SR 95 between Vernon Heights Blvd. and University Dr.
8 AM MONDAY 9/10/18: SR 95 will be reduced to one lane in both directions. 4 PM FRIDAY 10/5/18: All lanes open. SR 95 between Vine St. and Park Blvd. 8 AM MONDAY 9/10/18: SR 95 WB will be reduced to one lane. 5 PM FRIDAY 11/2/18: All lanes open. Blaine Ave. between Church St. and Columbia St.
8 AM MONDAY 9/10/18: Blaine Ave. will be reduced to one lane in both directions. Columbia St. between Davids St. and Blaine Ave.
8 AM MONDAY 9/10/18: Columbia St. EB will be reduced to one lane. Vine St. between E. Church St. and E. Center St.
7 AM MONDAY 9/17/18: Vine St. NB will be reduced to one lane. 5 PM FRIDAY 10/5/18: All lanes open. Shorter days cooler temperatures and sweet apple cider usher in the fall season, and with it Log Cabin Days at Hochstetler Log Homes, Friday, Sept.14 and Saturday, Sept. 15. This year the highlight of the event will be the log home tour, where visitors are able to go through up to 12 log homes and discover the casual, relaxing lifestyle that characterizes log home living. This self- guided tour is available for a small donation to the American Cancer Society. The two day free family event will also include demonstrations of lumberjack, ax throwing, wood chopping and cross cut sawing; 19th century log home related trades such as hand hewing, wood carving, furniture making, gun building, spinning and rug braiding; log home building; most will encourage audience participation; a lineup of excellent seminar speakers; over 40 booth exhibits containing log home style furnishings, builders and craftsmen; a silent auction for a multitude of handmade items including an authentic Amish quilt; a vintage steam engine and sawmill in operation. Kids will enjoy Log Cabin Days as much as the adults with the petting zoo giving them a chance to visit, up close, animals like a pony, calf, puppies, rabbits and kittens. Or, they can play gold-digger” and sift thru shavings for small trinkets and coins, or take their first pony ride. Others may join the families for a relaxing covered wagon ride through the woods. Always a popular destination is the food tent with an array of authentic old-fashioned, mouth- watering food. Delicious barbeque chicken, noodles, potatoes salad, baked beans and a variety of pies will tempt the pallete. There is also homemade ice cream, fry pies, fresh –squeezed apple cider, apple butter and kettle cooked popcorn to further whet the appetite. I think it’s safe to say no one should leave hungry! Additionally there will be fresh produce; locally made Amish Swiss cheese and trail bologna; plus assorted jams jellies, honey and maple syrup. Most events are free and we look forward to seeing you there! “When my office’s Bureau of Criminal Investigation (BCI) began conducting familial DNA testing in Ohio in 2016, we reserved this scientific analysis for the most serious unsolved crimes and serial cases with a public safety component. The assaults targeting women in parks and bike trails in the areas of Portage, Stark, and Mahoning counties met all the criteria needed for me to authorize the use of this specialized DNA testing for this case. “Our BCI scientists worked exceptionally hard to conduct this complex testing, which ultimately identified a potential relative of the unknown attacker in the Combined DNA Index System (CODIS). A team of local, state, and federal investigators then used that investigative lead to help pinpoint a suspect. Approximately 14 hours after the familial DNA testing results were released, authorities made an arrest. “I am truly grateful to all of the local and federal investigating agencies, as well as our BCI scientists, special agents, and criminal intelligence analysts, who dedicated themselves to this case. This is a strong example of our commitment to protecting Ohio’s residents and holding sexual predators accountable. Shawn Wendling, 37, of Hillsville, Pennsylvania, is currently incarcerated in the Portage County Jail. Authorities with the Portage County Sheriff’s Office, Portage County Drug Task Force, Ohio Bureau of Criminal Investigation, Federal Bureau of Investigation, Drug Enforcement Administration, Poland Township Police Department, Stark County Park District, Portage County Park District, and Ohio Division of Wildlife investigated the case. Red Bull Soapbox will once again make its way back to Cincinnati for the third time since it’s 2008 debut. Red Bull Soapbox gives both experienced racers and amateurs alike a chance to tap into their inner youth to design and build the most outrageous vehicle with one goal in mind, to make it down the course the fastest and with their creation in one piece. In order to be crowned king or queen of the hill you’ll need more than just skill, teams will be judged on criteria of one-third speed, one-third creativity and one-third showmanship. With crafts including sea cowboys, vicious Vikings and even Fortnite characters, thousands will gather to witness these whacky contraptions compete downhill against their biggest opponent…gravity. Free and open to all ages. No tickets required. Visit www.redbullsoapboxrace.com for more info on teams, venue access, and restricted items allowed at the event site.